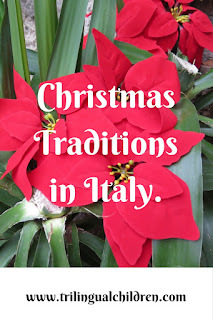 Google+ Raising a Trilingual Child: Christmas Traditions in Italy. 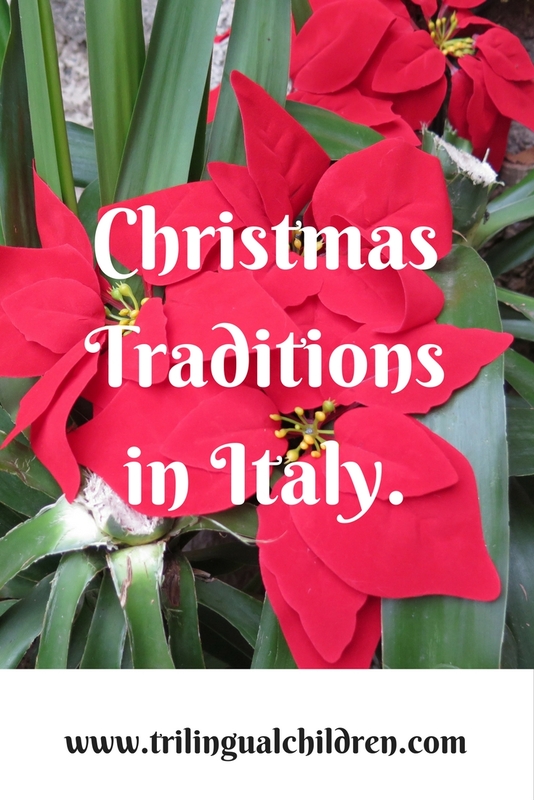 We live in Italy and Christmas is my kids’ favorite holiday because of the magic of the Christmas tree’s lights and, of course, because of lots of presents that Santa Claus brings them! Christmas in Italy is celebrated on 25th of December, as in other catholic countries; however, I was surprised to learn that not all Italian catholic kids receive presents that day. In many Northern Italian cities, which once belonged to the Most Serene Republic of Venice, children receive sweets and presents 12 days earlier! The night from 12 to 13 December Santa Lucia, a blind woman who is walking around towns and rings a bell, brings sweets and presents to the children living in the northern part of Italy: Trentino, Udine, Bergamo, Brescia, Cremona, Lodi, Mantova, Piacenza, Parma, Reggio Emilia, Verona regions. Babbo Natale (Santa Claus) and in some places Bambino Gesu (Baby Jesus) , brings presents on the night from 24 to 25 December to the majority of Italians. Some lucky kids receive a second round of presents. In Alto Adige, Trieste and Bari kids receive presents from San Nicolas. In Napoli la Befana, a kind Italian Christmas witch, brings presents and sweets to kids the night of January, 5th. 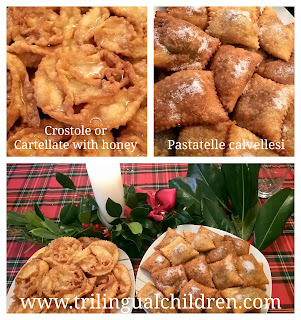 In other parts of Italy, she brings just sweets as an addition to the presents received from Santa Lucia, baby Jesus, Saint Nicholas or Santa Claus. La Befana often leaves a lump of coal (made of sugar) inside children's stockings to remind them that they can behave a bit better than the previous year. Xmas tree and Presepe (Nativity Scene). And another interesting discovery! 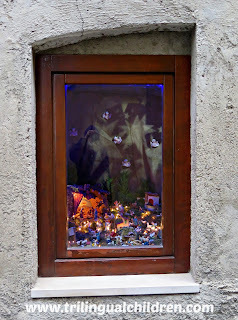 Some of Italian houses have a presepe instead of a xmas trees. 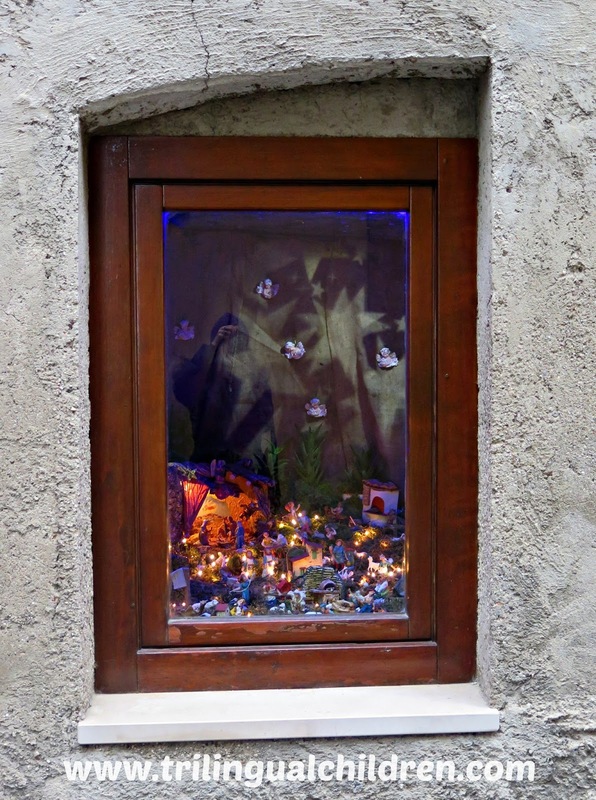 Presepe is a nativity scene that families start building on 8 December. It contains small figures, some of them are even animated! Every year the scene gets some improvement: a new figure or a decorative element is added. Italians take a particular pride in presepe. Many expose their work outside their homes, in a garden or in a window, for others to enjoy. Italy is relatively small country, but it is HUGE if you measure it by the wast variety of dishes and recipes the country has to offer. Different regions have VERY DIFFERENT FOOD! You will not find the same standard Christmas dish. Every table in every family will be different. However, a general preference can be notices: fish dishes in the south of Italy and meat dishes in the north. The Christmas celebration starts with a dinner on Christmas Eve, called Vigilia in Italian. Many course dinner runs upto the midnight mass which is the culmination point of the celebration. The Christmas day is celebrated with the lunch. Here are some menu examples. - pate con gelatina and salumi, included salame cremonese. - panettone stuffed with ricotta cream. Globalization makes its impact even here. Originally from Milan Italian Christmas cake Panettone starts appearing on the tables around the globe and slowly even in the south of Italy. 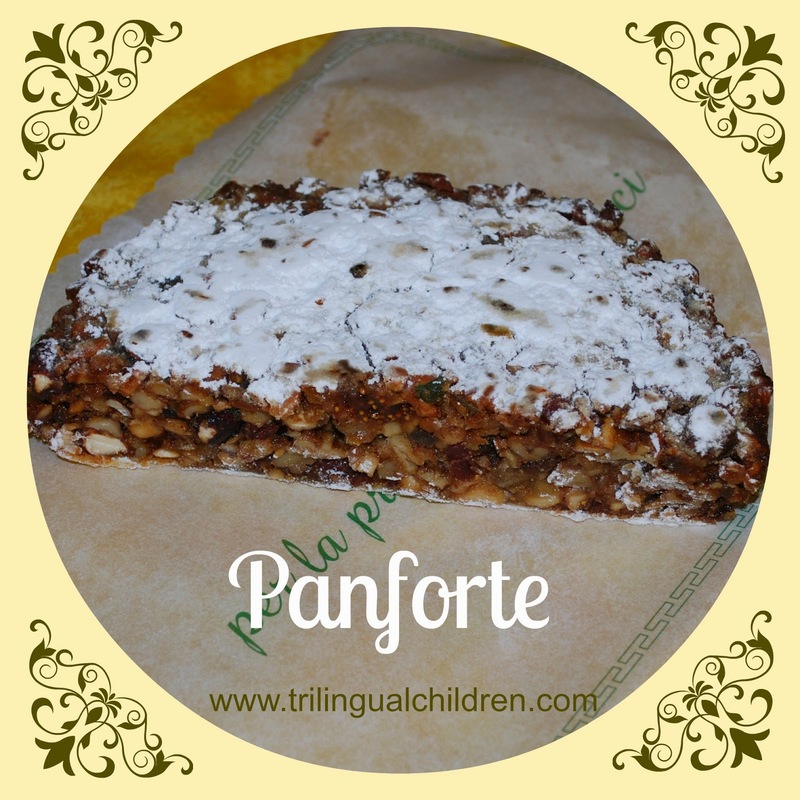 Italian dry Christmas cake Panforte is delicious! It has nuts, figs, citrus pills mixed with honey and flour. It is so rich in taste. The one on the photo we bought while traveling in Tuscany. It is one of our family's favorite cakes! even our kids love it! Traditional panforte is the one you should try first. 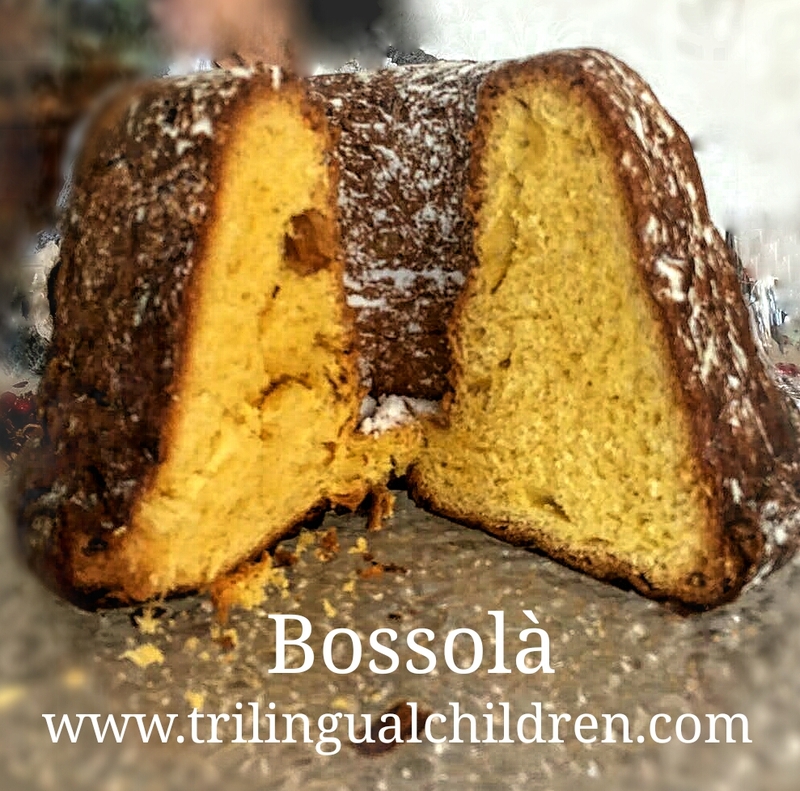 Pandoro is an Italian Christmas cake with butter and eggs as main ingredients that is covered with powder sugar. If you cut it like on the photo below, each piece of the cake is a star. This makes Pandoro a great center piece of Christmas tables. You can decorate it with fruits, sparklers or even with candles as my kids did. You can add cream layers too, or just serve it with mascarpone cream on a side, as we did. Try to prepare a Pandoro using the following Italian approved Pandoro recipe. Gubana is a very particular Italian Christmas cake from Udine. Try to make your Gubana, following this Gubana recipe. Even if my favorite Italian Christmas cake is a traditional Panettone, I love the delicate taste of BOSSOLÀ, it is another great Italian Christmas cake all Pandoro lovers should try! 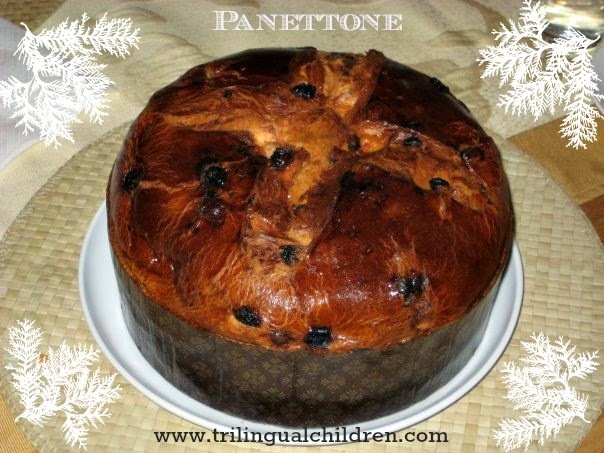 It is also called Pan di fich or Panettone valtellinese. 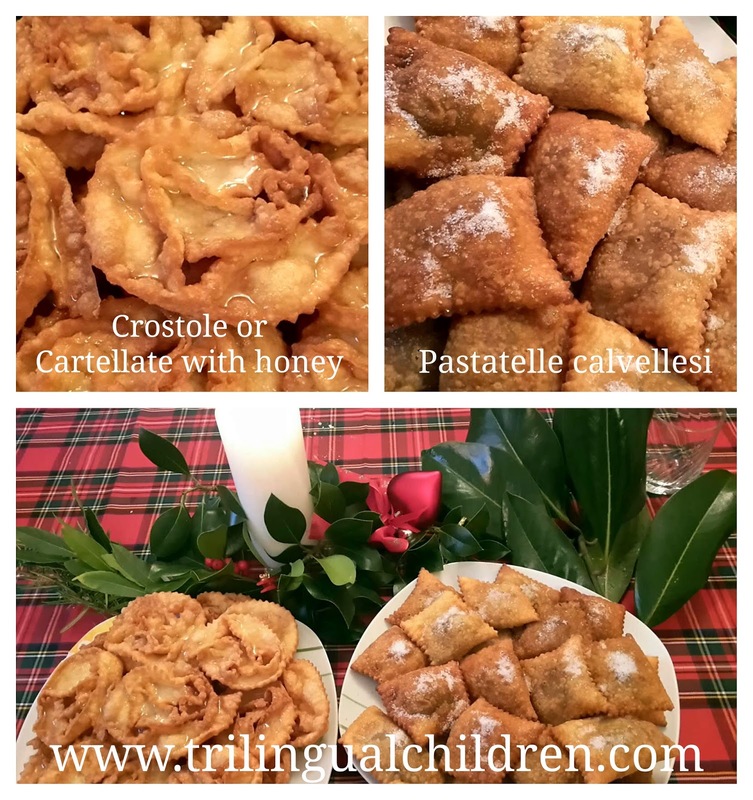 Typical Italian Christmas sweet from Valtellina, Sondrio province, Lombardia region. 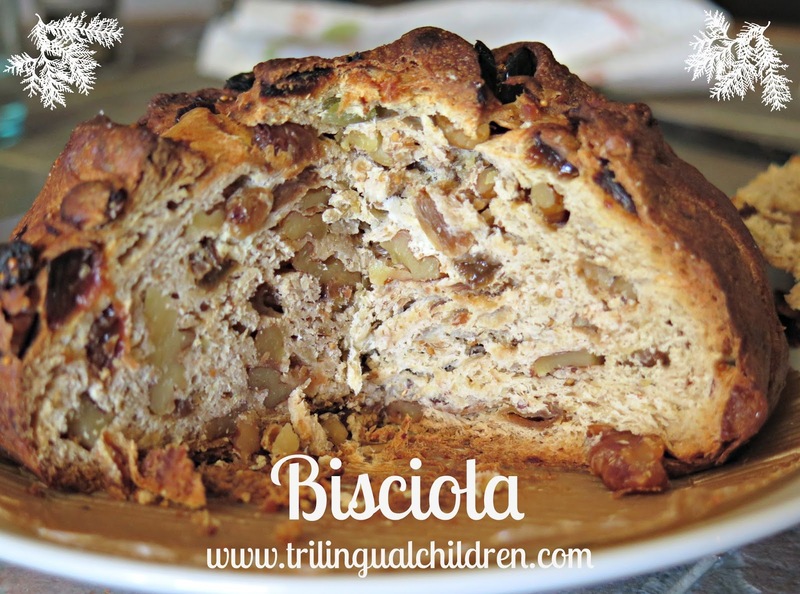 Bisciola is made of dry fruits, butter and eggs. Have you already got a calendar for 2018? Check out this coloring calendar monthly planner that I created. Illustrated by Maria Soldatova. Kids Radio Sations from around the world! In so many different languages !